Lovely capture of your sky! what a beautiful atmospheric photo. The dark clouds look rather foreboding! Great shot! We had a large share of rain over Thanksgiving and the bad thing is we flood so makes for facilities having to be carefully used. Bad timing with kids coming for the holiday. Now though, it looks like no more rain for a bit and some more snow. Yes, we’ve gotten a good soaking over the past couple days. Pretty cloud shot! 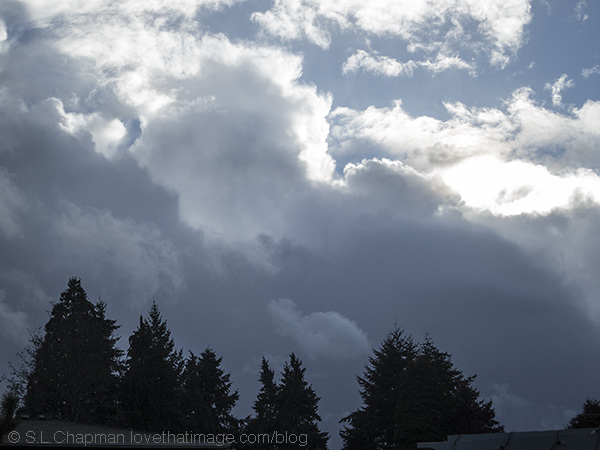 I like the contrast you captured in the clouds…light and dark…pretty. Helluva nice view from your house! Hopefully the rains did not cause flooding/mudslides…back East, that’s what we always seem to be reading about… the extremes from those to droughts/fires..
Love the light on the clouds.